Quilty Habit: So, you want to buy a new sewing machine. About a year ago, I started to seriously consider buying a legitimate sewing machine. Okay, yes, I had a *technically* legitimate machine - I bought my Brother (see bottom of post for a picture) for $70 at Walmart in summer of 2010, to finish my first couple of quilts. At that time, I could never see myself buying a machine worth hundreds of dollars. But I was bit by the quilting bug, and it's such a huge part of my life that I can never turn back. -A large harp space (the distance between the needle and the rest of the machine) - this obviously helps with quilting. I've now gone from a (whopping) 4.5 inches to 9 (absolute bliss)! I am in no way bashing my first machine - it did me well - but it's not meant to do what I need it to do anymore. -Applique stitches (there are some great powerhorse machines out there that only do straight stitch, but I really enjoy applique and use it often, so this was a must). -Something that was very sturdy. I've found that most (if not all) of the professional machines are relatively heavy - and I was sick of my little machine literally tipping over while I was trying to push a quilt through it! It was a workout to do everything - I go to the gym for that ;) Really, though - quilting and sewing are therapeutic and relaxing for me, and it was frustrating to deal with all the issues a tiny machine brings. -More control with stitching (again, something that would be easier with basically any "professional" machine). Both of my bloggy friends Sara and Lynne suggested the Janome Memory Craft, and I was intrigued. It had all of the things on my list, and was at a price I was willing to buy. Things I was lucky to get with the Janome MC 6300 that weren't on my must have list: needle up/down button, automatic thread cutter (press the button and that's it! ), drop in bobbin from the top, and a knee lift for the presser foot (THE BEST THING EVER - seriously, if you've never tried one out, you need to). My mom and I made plans to visit Pocono Sew & Vac, which is located not too far from us in Stroudsburg, PA. We made a day of it - lunch and coffee included :) I went to Pocono Sew & Vac because they have a great reputation and have so many brands to sample. I even was able to browse online before I arrived! We drove past it to find a parking spot and I literally felt my heart rate speed up when I saw all the sewing machine brands all lit up in the window. I'm not embarrassed to share that :) Haha. 1. You get to test drive the machines. Bring swatches and thread with you just in case - although Pocono Sew & Vac had everything all ready to go. I came in and while I was walking around, I was encouraged to "just play" and "have fun" :D When I played with the Janome, I was in complete awe, and the saleslady said, "It feels like you've died and gone to heaven, doesn't it? We've all been there!" Point is: if you are going to pay good money to buy a serious machine, you should know exactly what you are buying. 2. You can talk to people who know the machines. I am one for buying things online (really, I am - 95% of the fabric I buy is online, for example), but talking to someone in person really helped. 4. Seriously, though - there might be a sale you don't know about. Case in point: my Janome ended up being on double sale because of their quilt show next week - it was sold cheaper at the shop than on Amazon. Score. 5. You can pick up any notions - bobbins, needles, etc. - you might need for your new legitimate machine/new brand, instead of waiting for them to ship to you. Just saying! I walked in, saw the Janome Memory Craft 6300, was shown how to use it, and agreed to buy it (like it was even a question ;)) within minutes. They wheeled it out in a box just a minute later! Haha, I was so giddy, it was ridiculous =D I bought the 6300 because the 6500 (from what I could tell) only had extra special lettering stitches, which I don't need. Plus, this one was priced so well, I couldn't pass it up. Oh, little Brother, we had our fun.... but sorry. It was time for this serious quilter to accept that seriousness and move on! If you've read this far (thanks! ), you deserve a sneak peak at all the quilting I've been doing for the Emerald Challenge! I just finished today and I can't WAIT to show you this one :) My Janome sews and quilts like a dream - everything is just SO much easier. I can't see myself needing another machine for a long, long, long time (maybe even ever). Let me know if you have any questions or need advice on buying a machine! I'd be happy to help :) Feel free to leave a comment or email me! Oh you sound soooo excited. Good for you!!! I bought my MC6500 in 2005, after literally wearing out my Singer (which I had sewn clothing and quilts on for *years*). I love my Janome. It is awesome. If your 6300 (which, I confess I didn't know existed) is just a step down from mine, you will LOVE LOVE LOVE it. I'm a Serious Quilter :-) and my Janome does absolutely everything I've asked of it without any problems whatsoever. I've done a fair amount of free motion quilting on it but will admit that after wrestling a queen-sized quilt through that throat space, I swore I would never, ever, ever quilt a quilt that size again on that machine. It's just really cumbersome and aggravating. But other than that *one* experience, I can sing high praises for the machine and unless it just blows up in my face, I don't anticipate replacing it for decades, if ever. I can't imagine what a home sewing machine would need to have for me to think of replacing it. I am so glad you shared your experience with us! I have told you how attached to my machine I am since it was gift from my late grandfather who taught me to sew. However I desperately need a new machine as my bobbin is giving me issues and I think at this point it's beyond repair. I will prob pass mine on to Sofia and head to this same place. I went to a craft fair and test drove every machine in my budget; it took me five hours! From that, I had a short list of three so I called the sewing machine mechanic and asked his opinion (just as I would call my auto mechanic if I was about to buy a new car) -- his recommendation regarding availability of parts and ease of working on tipped the balance in favour if the Janome! I bought it from a large sewing centre and they threw in fabric, thread, a pair of scissors and a tool box for free! Why I bought my MC 6300: wanted another Janome (had been using my mom's 15+ year old and loved it), needed an on/off button, needle up/down control, larger harp space, be good with FMQ and other useful stitches, and a knee lifter (which I didn't actually use until two years later, hm). Things I love about it: thread cutter, needle threader, and able to use over sized spools without issue. I do wish it had a free arm though! Great information, Jessica! I have a brother that sews and embroiders as well…absolutely love it! This is an amazing post and totally what I was looking for. 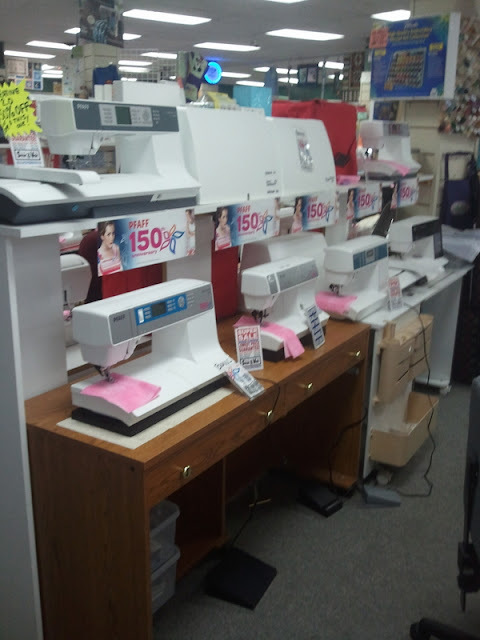 I wanted to start sewing and have been looking for a sewing machine for beginners. Glad I came across your post. Thank you.